Is this really how the dream ends? You think this is what’s best for us? They humiliated you on a cross. And we’re humiliated too, because we put our trust in you. No wonder Peter denied you. that this is how the dream ended. How can you think this is what’s best for us? We put everything we had into you. Our belief that you were the one who could save us. and you promised an eternity of that. and you took us with you anyway. Of course, we know that the disciples mourning turned to joy a few days later. The story didn't end there. I can't help but wonder, though, if this poem doesn't resonate deeper with many of us. It certainly did with me. There is a level at which we can struggle in this walk with Jesus. Sure, we have had an encounter with Him at some point. Maybe there are a number of points at which we have encountered Him in a deeply meaningful and personal way, where He has touched our hearts and transformed us, turned our lives upside down, to the place where we think we will never be the same again, where we sing for joy, where we leap and dance in our freedom. However now, right now we walk in a place where it feels as though the sun will never shine, where we feel like the breakthrough will never come, where we can feel like death has won the victory, and we have nothing left; that we put all we had into this walk, into this relationship with God, but somehow, at some point, He has let us down. He hasn't come through with 'the goods' as we were expecting, that we would like. He hasn't done what we thought He should. And it hurts. It might be with our marriage, our kids, our workplace or career. It may be our health, or the health of a loved one. We have put all our hope in Him being our breakthrough, and it hasn't happened. We feel the dream has died and we are left like a child holding the empty string of our popped balloon, feeling dismal and disappointed. Where are you now, God? So what do we do with these feelings? For many of us, we hold onto hope. Maybe it is only really public hope - we put on our "Sunday-go-to-meetin'" faces, giving the expected appearance of a "good Christian", but at home, we take it out on the cat, the dog or anyone else available. Or we hold it all inside, quietly dying; day by day our soul shrivelling and drying up. For others, we do the opposite. Our hurt and betrayal are so complete that we display them for all the world to see. We either reject the notion of God altogether, or we paint Him as a tyrant or megalomaniac, out to cause us maximum pain, or just plain powerless and useless, like the Wizard of Oz. There is no easy answer for this space. However, on Saturday I experienced a parallel in the physical as we went mountain climbing. The route we took up to Sugarloaf Peak in the Cathedral Ranges was the harder one, with many a rock climb. 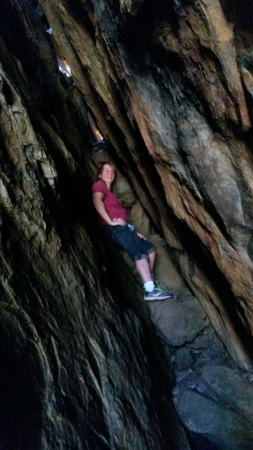 At several points, we had to squeeze through the crevice between two rocks while climbing near vertical rock faces, without ropes or other climbing equipment. The one in the photo was such an example to me of the difficulties and despair we feel in some of our circumstances. As I looked up where we needed to get to, all I could see were huge boulders, sheer rock face and difficulty, with a pin point of light at the end. I presumed we could get up there, because others had been before us. Whether I could do it...well, let's just say I was hoping determination would get me nine tenths of the way. The other tenth I wasn't so sure about and did my best to ignore. Looking up at the way ahead, I could not see at all how I was going to get up there, where the footholds would be, or what position I would need to be in. There was no obvious way up. I just had to guess that when I got to that next bit, I would be able to see, or I would work it out. And at some points, it took me a few tries to get into a position where I could actually lift myself, so I could inch my way forward. There were times that I wasn't sure I could keep going; that I would make it through, but I knew it would be at least as difficult going back, and if we went back, I would miss getting to the summit. Even when we got through that massive crevice, there were still more almost impossible climbs up vertical walls and another crack between two rocks where we had to lever off both walls again, with few foot and hand holds. But when we got to the top! The sense of accomplishment, coupled with the 360 degree view was almost overwhelming. I just wanted to stay there. I could completely relate to the disciples, when they were on that mountain with Jesus and they wanted to set up camp there - although perhaps they were just like me amd secretly concerned whether they had the energy and strength to go back down! The point of this story is that we can look at our situations and not see a way ahead. We can feel as though that pinpoint of light (or hope) is too small, or is non-existent. We can wonder if we have the strength or stamina to get through it, to make the journey, or if we even want to. What kept me going this day? Well, I did have a trusty companion with me, who gave me the occasional hand or leg up as well as verbal encouragement. I was not alone. I also knew that many others had gone before me and had survived, had made it to the top. Some of them I had even heard up ahead, and some, as we came to the last climb, were up the top cheering us on. Knowing that these walks are open to the public, I had faith in our parks management not to allow people to go ways that were too dangerous or impossible. it may look like Friday, but Sunday will surely come! Just hold on and take the next step forward. And I will stand with you in hope, faith and a little experience that what we get to see at the end is worth it all.